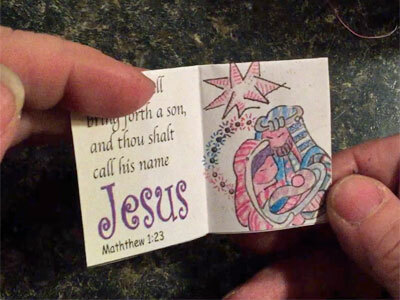 It took Jackie just over 11 minutes, start to finish, to assemble this Mini Bible Christmas Ornament. We hope all of you will join in the fun. 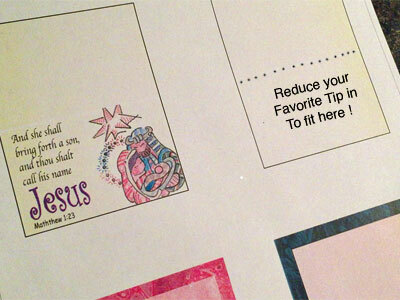 Whether you want to use our art (Top Left) or use your own reduced tip-in or personal doodle using the page template (Top Right) the first step is to print the FREE PROJECT PRINTABLE from the link above, on 20 lb. bond or photo paper. Cut out the inside pages and the cover pages just to the inside of the black lines. 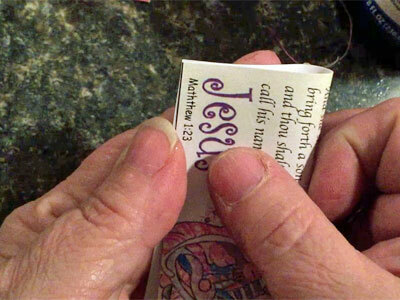 After you have glued and folded the cover you may see that you need to trim a bit more to make the cover look perfect. 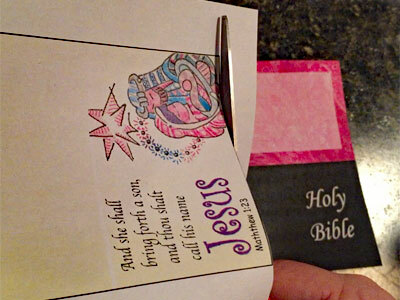 Follow the same steps for the inside pages: Put glue on the back of the paper; fold it in half top to bottom. 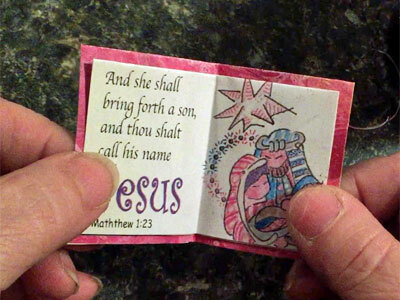 Then fold in half right to left, so it looks like the inside of a book. 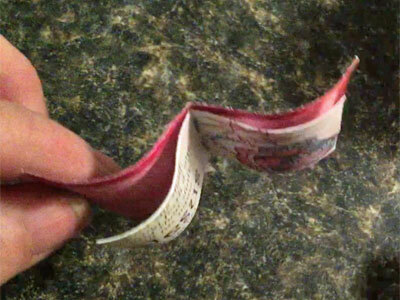 Line up the inside pages with the cover. 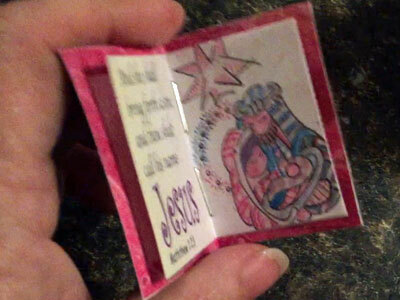 At this point you could use a tacky glue to glue the inside pages into the cover, but it would not be as 3 dimensional. 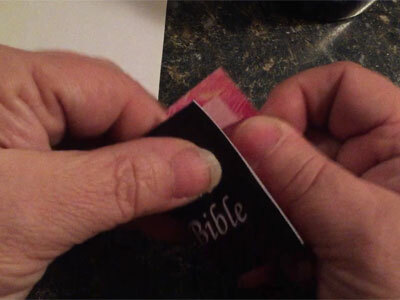 I used two staples to fasten the inside pages to the cover. 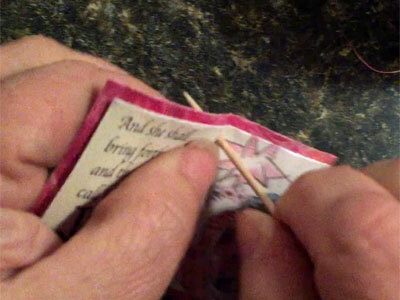 If you have a sewing machine handy you could use a cream colored thread and sew it together. 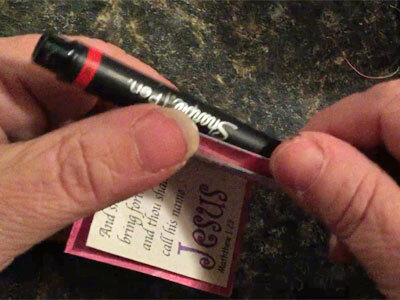 If you have watch the video, you will see me rolling the cover and inside pages around a Sharpie pen barrel, one page at a time. 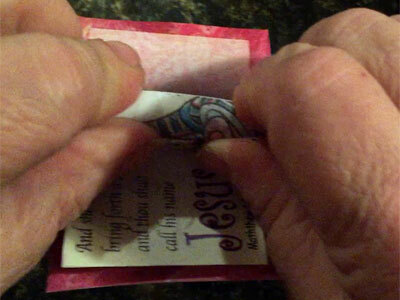 Rolling the pages gives a much more “Book-Like” appearance. 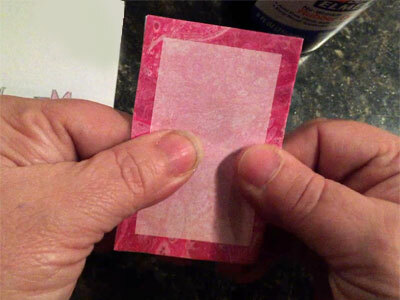 I used a piece of 1/4″ wide red ribbon. You can use any kind of thin ribbon, string, unfolded paperclip or ornament hanger, new or recycled. 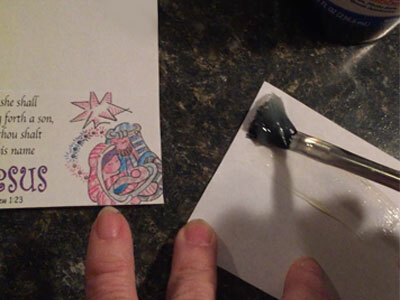 Since my hole was tiny and the ribbon was 1/4″ wide, I pulled a staple out of scrap paper. 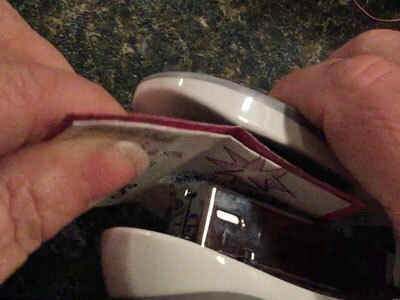 (please watch video) Then slid the ribbon on one side of the staple and straightened the other side. 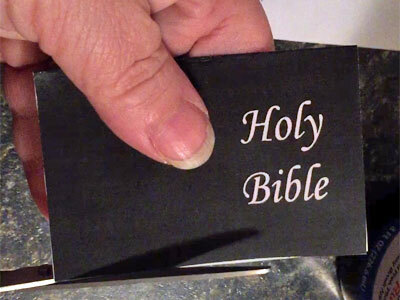 I pushed the straightened side of the staple through the hole just like a needle and thread and gently pulled a loop of the ribbon through my Mini Bible. 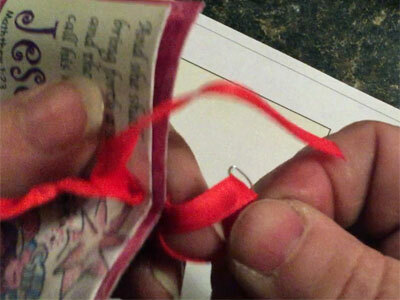 I discarded the staple and pulled the loose ends of the ribbon through the loop. (Watch the video if you haven’t already, it is much easier than it sounds). 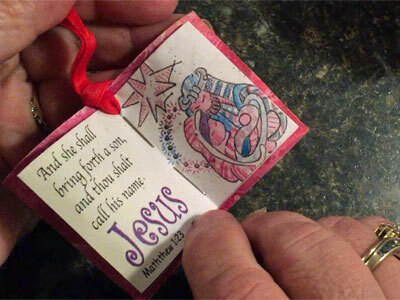 This is what my finished Mini Bible Christmas Ornament looks like. 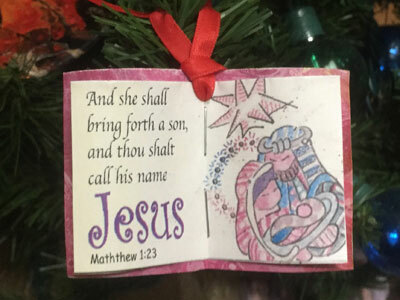 I could have embellished it it further, by retracing the black lines to make them bolder, using a glitter pen on the word Jesus and on the star above them or a wide variety of other artsy things, but as is, it is a cute little ornament ! May you have the Happiest of Holidays celebrating Christ’s birth!